If native resolution fully stitched mosaics are needed for your workflow, all SlantView licenses include the free Lite license for exporting your data for processing in Pix4D, Drone Deploy, and other native resolution mosaic stitching tools. Keep in mind, the industry standard to generate native resolution stitched mosaics of highly aliasing-prone agricultural image data is minimum 80% overlap, resulting in 4x the flight time and 16x the raw data. Navigate to Data--Export--Options to format the image exports as needed. 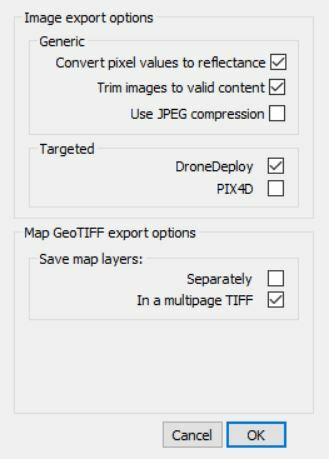 The required formats for importing data to Pix4D and Drone Deploy can be selected with the checkboxes. Convert pixel values to reflectance: When selected, image exports are reflectance values rather than intensities. For green crops, the sensor&apos;s red and green bands often appear very dark due to the reflectivities typically below 15%. Trim images to valid content: When selected, only the image content shared between all four bands of the SLANTRANGE sensor will be included in the exports. When unselected, black borders are visible around each image, showing the border pixels visible in 3 or fewer of the 4 images planes. Use JPEG compression: When selected, image exports will be JPEG compressed with a quality factor of 90. For your SLANTRANGE images to import correctly into Pix4D, the Convert pixel values to reflectance option must selected, and the Trim images to valid content option must be unselected. This settings profile is selected automatically once the Pix4D box is checked. If these options are modified, the Pix4D box will automatically uncheck.